生徒作品NO.1223☆１年生コース　☆　高級シャツ地でいいシルエットのブラウス完成！　☆　The last blouse using high quality Italian made fabric. A student who makes me think that age does not matter for learning. This is the final work of the blouses of her first grade course. the final is five works counted from the sleeveless blouse. it takes you time. but the design allows you to create whatever you want! This student copied her easy-to-wear shirt. and the fabric is made of high quality Italian made. 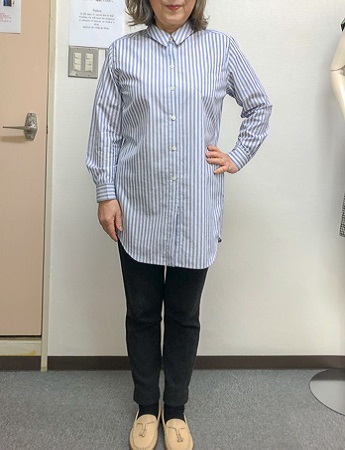 she said “This is also difficult to cut, but more difficult to sew.” But she concentrated so hard on it and re-stitched a severl times in order to make this shirt beautiful.wonderful work! !